Butternut Squash, Apple, Gorgonzola Gratin. Photo Credit Emily Wiley. Rub 1 1/2 Tbsp basting oil into a 2-quart shallow casserole dish. Place casserole dish on a baking sheet. Cover the bottom of the dish with a layer of squash. Season with salt and pepper and half of the nutmeg. Repeat with remaining squash; season with salt and pepper and remaining nutmeg. Pour heavy cream over all. Bake for 30 minutes, then remove from the oven. Press the squash/cream mixture using a spatula, and return to oven. Bake 10 minutes more, then remove. Toss apples with 1 Tbsp basting oil in a small bowl. Cover the top of the squash mixture with single layer of apple slices, overlapping slightly and pressing apple slices gently into creamy mixture with a spatula. Return casserole to the oven. 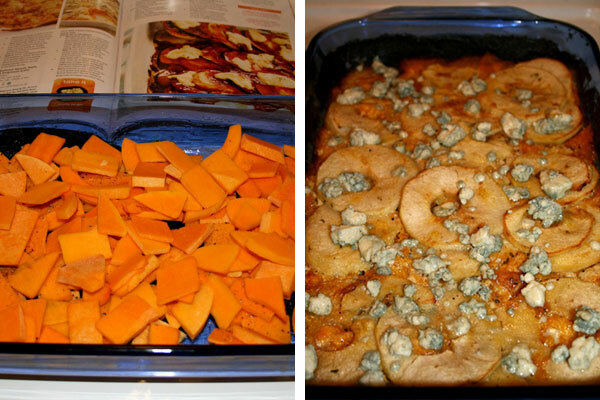 Bake for 45-50 minutes, or until squash and apples are tender. Remove from the oven. Top with dollops of Gorgonzola, and let the cheese melt before serving.